We live in a connected world and yet, on a boat, connectivity remains a real challenge. Since I work full time while cruising often unpopulated parts of the world, connectivity is particularly challenging. Our approach is a hierarchy of options. Depending upon what is available, the top of the hierarchy is the highest bandwidth and, generally, the cheapest. The bottom of the hierarchy is the lowest bandwidth and most expensive. Our first option is always WiFi. WiFi is generally the cheapest option available and is usually the highest bandwidth. Much of the South Pacific never got “last mile” wiring and so WiFi ends up becoming ubiquitous there. That’s what everyone uses and, as a consequence, it’s often widely available and at surprising distances from the base station. Often much further than in the U.S. I suspect some countries allow or don’t prevent transmission powers above those in the U.S. — or perhaps the antennas are just very well placed. For WiFi, we run a WiFi antenna 30 feet above water at the top of our stack and use a good quality external transceiver. Signal boosters like Bullit are available, and we plan to try one but haven’t yet. The next option is cellular. When traveling the world we each have unlocked GSM phones, so if we are going to be in an area for a while, we’ll buy a SIM card and usually open a prepaid account. When prepaid is not the cheapest option, we might do a longer-term contract depending upon how long we will be in country. Like WiFi, cellular will work over much longer distances in some parts of the world than in the U.S. In the U.S., the cells are often configured smaller and closer together to support a large number of subscribers. When the cells are smaller and closer together, they need to operate at lower power and, as a consequence, they don’t transmit far offshore. Cell service in places like Fiji ends up working much further from shore and, ironically, is much less expensive than in the U.S. But whether the service is inexpensive or not, it’s always much cheaper than satellite, so we always use cellular when we can. We typically just use a phone since that allows us to use a single SIM for both mobile connectivity and at the boat. An option that will work for many is to install a high-frequency radio and use a service like SailMail over a Pactor modem. This is far cheaper than any satellite service, but good high-frequency radio installs require some skill and there are other drawbacks. A high frequency radio is around $3,000. Some services don’t allow commercial use. And none can move large amounts of data. Since I am working, it is commercial that I use and I need to move 100s of emails each day — some with ridiculously large attachments. Consequently, high-frequency radio is not an option that can work so we skip that option and go straight from cellular to satellite when cell becomes unavailable. The next option is satellite and at this point things get expensive. The current best satellite option for moving large amounts of data is a mini-VSAT system. These are the most economical for large data volumes but the gear itself is expensive. We use a KVH V7 but a V3 is also a good option with coverage areas only slightly smaller than a V7. The V7, should you go that route, is an expensive piece of equipment at more than $30,000, so not worth doing unless your travels and data transmission requires it. We love the option but it is very expensive. As much as we like the KVH V7 mini-VSAT system, it actually doesn’t cover the world, including the South pacific, much of the Indian Ocean, and both poles. We use it when we can because the service is excellent and the data rates are very good. But, when in an area where mini-VSAT is not available, we use Immarsat BGAN. The good news on BGAN is the transmission system is inexpensive compared to mini-VSAT. A good BGAN system can be had for $3,000. More good news is it is actually a very high performance system. So why not use it all the time if the gear is cheap and the performance is excellent? BGAN has two problems. The minor problem is you need to hand aim the antenna when on a mobile platform. The major obstacle is the cost of moving data is stratospheric. Actually, it’s higher than that. A gigabyte of data is $8,000 dollars. I know that looks like a misprint but it really isn’t. That’s why we like mini-VSAT. The final option if nothing else is available due to failure or obstruction is to go with Iridium. Iridium has a relatively inexpensive satellite phone available — less than one-third the cost of BGAN. And, since Iridium is based upon Low Earth Orbiting (LEO) satellites, it is available absolutely everywhere on the planet. That’s why the U.S. military is their biggest customer. So why not use it all the time? The Iridium option has two problems as well. The first is the high cost of moving data. But the major problem is it is very slow at 9,600 BPS. Iridium ends up being the best primary option for many if not most cruisers not using high-frequency radio. But, for us, the speed is so slow that it doesn’t work adequately for the data volumes I need to move for work. We love it as a backup and it is wonderful to have something that works everywhere in the world. That’s what we do on Dirona. We are currently posting this via Telstra (cellular) from Cape Leveque in Western Australia. This article was first published in Three Sheets Northwest. Have you looked at distributors of the o3b network? Cruise ships offer speeds that allow passengers to do google hangouts or stream netflix! All the same can be done on Dirona with the KVH V7ip KU Band system on Dirona. You can watch video, play games, cruise the web exactly as with y our cruise ship experience. It’s more expensive that land based communications but that also is the same as a cruise ship. I toured Holland America Westerdam 2 summers back and they were using a combination of C-band and KU-band satelite transponders to get the coverage they wanted. 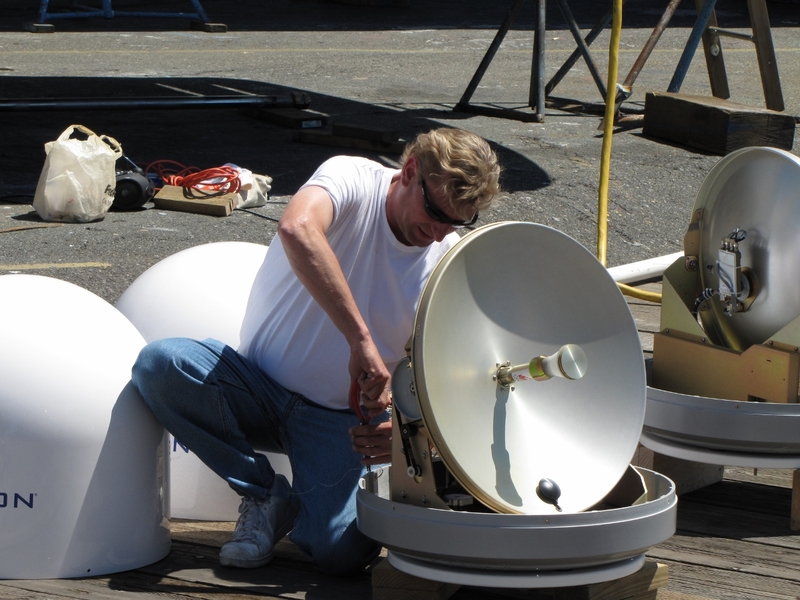 We are KU-band only — having C-band would give a bit more complete coverage but it requires a 1+ meter dome which wouldn’t fit on our boat. O3b communications is focusing on the poorly connected areas near the equator and up to 45 degrees each way. The upside is they cover the globe in that region. The downside is entire countries that aren’t really that far north, like Canada, aren’t covered at all. It looks to be updated periodically (weekly?). I don’t know where they get the data from, but it would be interesting to compare this analysis to your real world observations. Your right Bruce. The currents have been unusually negative. Just about the polar opposite of what we saw crossing the Tasman Sea from New Zealand to Australia. On that run, we actually got over 10 kts for a brief period. This one is slower going. We have looked at the current prediction models and I suspect they are probabably quite good on macro trends but they seem remarkably poor and prediting pin pont currents at a specific location. Broadly the current models are helpful but they are not great in detail. I’m starting to wonder if ocean current models are only there to make there to make weather models look more accurate in compirason :-). Hi James. Inmarsat successfully launched their 3rd Global Xpress satellite yesterday. This completes their Global Xpress constellation and when on station will give them worldwide coverage. As you probably know, Global Xpress claims to give 50Mbps download and 10Mbps upload speeds using a small 60cm antenna like your KVH V7. I haven’t seen any prices yet but the claim is that it would be comparable in price to the slower 1-2Mbps mini-VSAT plans you are currently using. This might be a significant breakthrough that is worth following. Hi Bruce. Thanks for the tip on the upcomming Imarsat offering. They haven’t had a very competitive line up for the last 5 years or so. Good to see them bringing out new technology and it’s certainly the case that more providers will likely drive faster innovation and better pricing. Overall, we don’t really need more B/W although it’s nice. What we need is universal coverage and the ability to move large amounts of data and good pricing. We like high bandwidth but would happily give it up for better value and broader coverage. We will keep an eye on Global Xpress. Thanks for the pointer. Yes, the new plans from KVH are top notch. They continue to innovate and are, by far, my favorite communications provider. These new plans have been in development for quite some time so I’m pretty sure they are not in response to any changes at Immarsat. My only disappointment right now is that the mini-VSAT coverage doesn’t include the Indian Ocean and the South Pacific so, when in those regions, we have to use other options and they are super expensive. Thanks for the pointer to the new KVH plans. How much is the monthly mini VSAT costs? Is it a service you can turn on and off..like when you are out of range of cellular or wireless signal. You also asked if the it be turned off and on at will. Yes, absolutely you can power it off and on whenver you want. With smart routers like Peplink can support multiple WAN connections and prioritize whichever one you want. Using a suitably equipped router you can make switching between different internet connections seamless if desired. I take your point about doing this while you can. We did something like this but travelling by so-called expedition ships. Off South Africa you will also need to think about the great white shark as well as the crocs. Australia has it’s share and perhaps more of Great Whites as well. The sharks, at least for us, are less of a concern than the crocs. With sharks there is risk but it can be minimized with care. With crocs the predator risk is really more of a guarantee than a risk. With the sharks we’re careful but with the crocs we don’t swim. An interesting post. Three questions. Are there significant disadvantages for you operating from the Dirona vs from a Google office? Is the challenge of operating from remote locations part of your remit – or is the experience gained just an incidental benefit for the work you do? I see that wifi connection is now being offered as an option on cars – are these set ups similar to yours? And OT: are you now in croc-free waters and able to swim? David, I can confirm it’s much easier working from Dirona than a Google office but that’s mostly because I’m an Amazon rather than Google employee :-). I do know what you mean though. I would generalize to say it’s more difficult to do everything while world cruising. It’s harder to get groceries, it’s harder to go the doctor, and work is either impossible more at least more difficult. It’s part of the cost of going around the world in a small boat. Well worth it from my perspective but the trip does make most things, including work, more difficult. I was originally planning to take 18 months off work and do the trip around the world on the basis of it being harder to do the trip post-retirement age, it’s difficult to predict ones health in that time frame, and we really wanted to do the trip. The way it has worked out is I have kept working which was a pleasent surprise but there is no question that working slows down the trip and does add some complications. No, we are not yet in Croc free waters and won’t be until we are heading off shore across the Indian Ocean on route towards South Africa which, incidentally, also has crocadiles. Thank you for a great article. I was wondering how you keep the communications up in the middle of the ocean (satellite being the obvious choice). I was suprised to see that you still work full-time during your voyages. How is that working? Every day 8+ hours, evenings off? Working at sea is a lot like working on land. It has it’s ups and downs and there are times when it takes more time than one would like. But, I really enjoy the job so continuing is something I really enjoy and there is no question that having a pay check still comming in is nice. I always get up pretty early in the morning and usually put in the bulk of the day starting then and we explore later in the day. Sometimes we’ll do things in the middle of the day and get back to the boat early and I’ll work more that afternoon and evening. Sometimes I work straight through and we take the evening off. 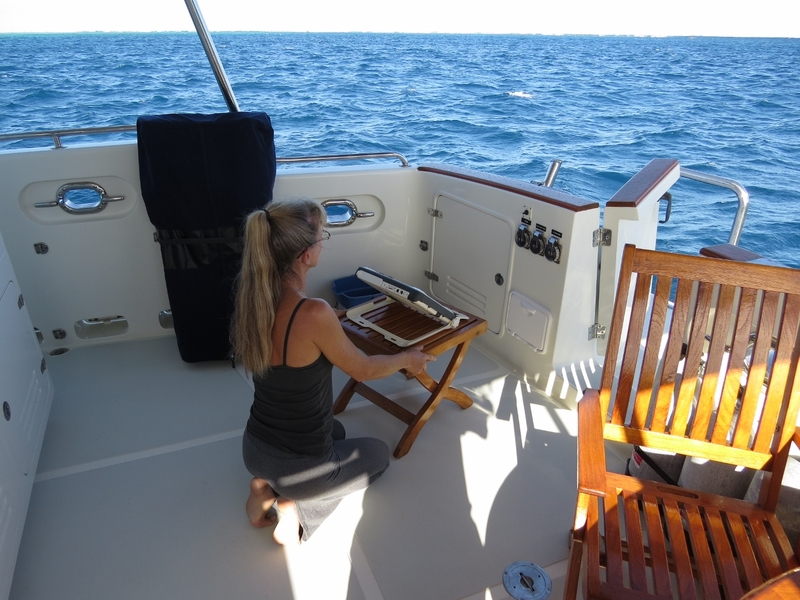 At sea when doing a long distance run, i tend to work even more unusual hours since Jennifer and I are trading regular shifts at the helm. The WiFi system we use is a stack mounted antena and an transceiver that you can interact with. You can connect to open access points, locked down access points, and you can chose what access point you want when there are mulitple candidates available. The particular system we are using is a Syrens but, having used it for a few years, it’s usability isn’t as good as it could be. It works fine but I suspect there better choice available. Thank you James. Recently I was struggling with getting my phone to work as a hotspot (Windows Phone, Nokia 635). Was able to find an app that turns the phone into a proxy server. By connecting the phone to a wireless router I now have cellular data on the same Wi-Fi system when Wi-Fi WAN is not available. Yes, that’s essentially what we do for WiFi connnectivity on the boat in cell coverage zones. 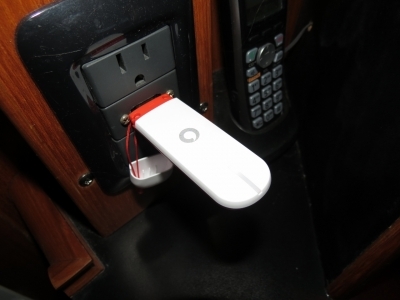 One of the phones is a hot spot and the boat WiFi connects to it. The phone support to create a WiFi hotspot is a standard Android feature and I’m pretty sure it is part of IOS as well. We like to use unlocked phones so we just pick up a local SIM card when we enter a new juristiction. Hi James, I wondered how you are able to work when traveling everywhere. Thanks for the info on how you do it. What do you use mostly for voice calls cell or satellite phones? I assume you have lots of conference calls. Het Steve. As you can imagine, we use a variety of solutions for voice calls. If we are doing a local call in cell coverage, we just use cell. Local calls outside of cell coverage we can use the VOIP support on the KVH V7 system which is excellent and fairly cost effective. We can use Google VOIP over whatever data connection we currently have And, Iridium is always available as well but nnot ideal for long calls (they really struggle with satelite live call hand off). For calls back to the US, we use Google voice which is fairly cheap, or the KVH V7 which is a US number (local call charges in the US no matter where we are). We can always use Iridium but it’s long distance to everywhere (think of Iridium as being it’s ount country).